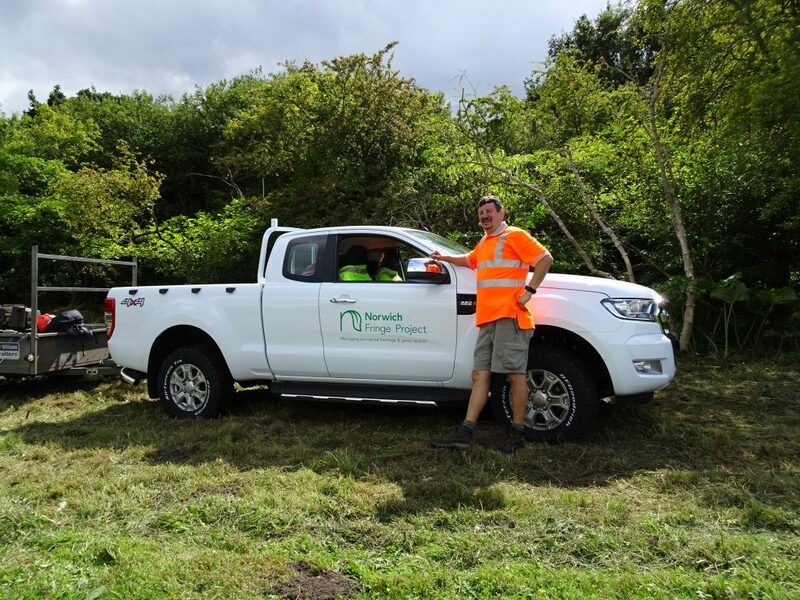 “Making hay while the sun shines” was the strapline for our Blog for August 2017 when we last cut back the meadow at Swardeston Common. The weather this year has been a bit mixed with a very hot day for our first cutting session at the end of July and then two rather wet days in August followed by an overcast day for our final session. Yes, it is better to make hay while the sun shines since when it is wet the grass, wild flowers and other stuff is difficult to cut and very heavy to rake up and clear away. 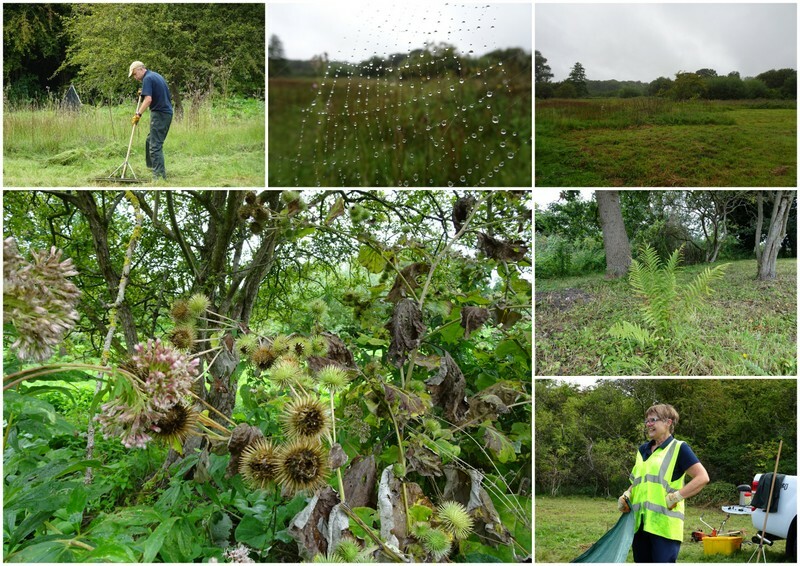 On Thursday 16th August it rained heavily all day, but we donned our waterproofs and got to work cutting and clearing a large area of the meadow. It was so wet that even the frogs came out to join us! Waterproofs help but working hard creates lots of condensation inside the garments and you get wet anyway. Thursday 23 August was another wet day with intermittent showers and sunshine. So, wet weather gear on again but quickly removed when the sun came out and we started to get steamed inside, but it was not too long before we had to put them back on again. 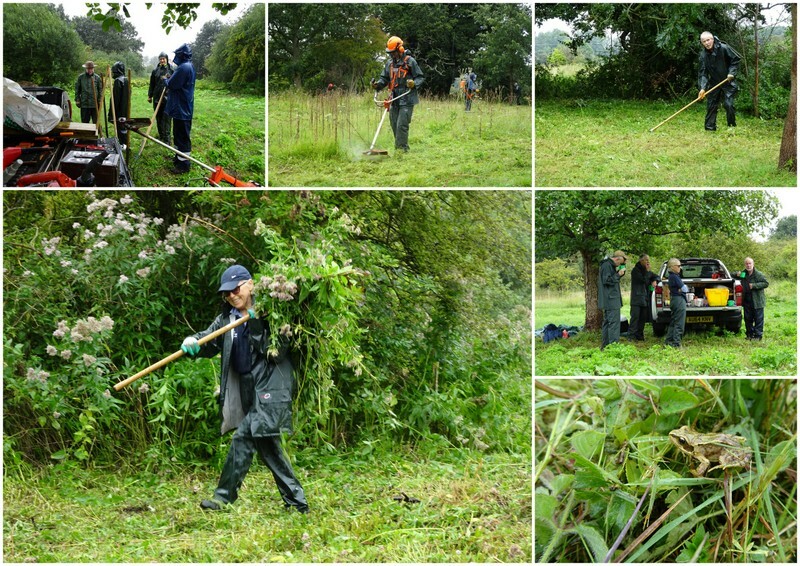 However, another large area was cut and cleared by our volunteers. For our final session on Friday 24th August it was sunny but a bit on the cool side. We were cutting some of the more difficult areas on the edge of the reedbed where the hemp agrimony and reed was intertwined with bindweed into a dense mass. The brushcutters struggled to cut through it and over tea Robert, Pete and I were discussing how tough this was and swapping experiences on the various cutting techniques we had each used. By the end of the day we had, of course, cut everything back and cleared the area adding the material to the piles around the edge of the site. Meanwhile Fireman Chris had run the mower around the site to cut back the edges of footpaths and then ran the mower over the meadow to cut back some of the bits we had missed with the brushcutters. Not quite a “bowling green” finish but the site looked good. So, as well as cutting the meadow to allow the wildflowers to grow next year we had also created many habitat piles around the site that would be beneficial to insects, grass snakes and other wildlife over-wintering on the common. The piles will rot down and by next summer will be barely noticeable – until we start all over again! The sharp-eyed amongst you will have noticed that in our most recent photos we have a different coloured truck. Matt has a new toy – a white 4X4 to replace the old silver model that had reached the end of its life. Our volunteers have to get used to the new truck since it is a bit different. Little things such as the rope hooks on the side are a different shape so we can no longer hang our bags on the sides. Matt still has a bit more customising to do such as a rear hard cover and new toolbox but being new the inside is currently organised with tools and kit bags easily accessible and neatly stowed. Much easier to find things but how long will that last?